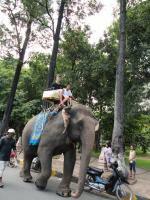 Sambo, the only elephant to survive the Khmer Rouge Regime, has become a symbol of the city. Sambo has survived the “Killing Fields” and this past January, Sambo turned 50 years old. Sambo is the heart and soul of Wat Phnom, and now Sambo has another challenge to face….finding a home. After having been knocked out late on Monday, 10.5.2010, by a bad, but not clearly identified intestinal infection, I am sorry that I could not earlier, and cannot more speedily, catch up again, but maybe it will be done by Monday, 17.5.2010, noon. Because of the King’s Birthday National Holiday on 13.5.2010, which was extended into further days, it is now intended to have publications, during the current week, only for Monday, Tuesday, Wednesday, Saturday, and Sunday. “Almost unbearable and hotter sunshine is getting public attention; this problem clearly shows that Cambodia is experiencing a change to a hotter climate as part of the global natural phenomena. The typhoon Ketsana indicated that Cambodia starts to face natural disaster, while the temperature is alarmingly getting hotter at present. In rural areas, the heat wave is affecting farmers, making it difficult for them to go out to their rice fields. The wind also brings the heat wave to wherever the people stay, even under the trees they still feel the hot wind. “Phnom Penh: The Ministry of Water Resources and Meteorology invited the six governors from Kompong Chhnang, Kompong Thom, Siem Reap, Banteay Meanchey, Battambang, and Pursat, and other related institutions, to attend a discussion in the morning of 6 May 2010 to determine what to do in three regions, and to decide actions on the reservoirs in a second area around the Tonle Sap Lake. The event was chaired by the Minister of Water Resources and Meteorology, Mr. Lim Kean Hor, at a meeting at the ministry, in order to find protective measures to timely prevent the possibility of a serious devastation of the Tonle Sap Lake and other related areas.